As Mary Kate Danaher in John Ford’s classic film The Quiet Man, Maureen O’Hara has engaged the hearts of viewers the world over for over five decades. Born Maureen Fitzsimons on August 17, 1921 in Ranelagh, Co. Dublin, O’Hara was one of several actors and singers in the family. Her mother was an actress and singer who performed on stage in Dublin, while her father, a clothing retailer, was one of the founders Dublin’s Shamrock Rovers soccer team. O’Hara began her career with the Abbey Theatre in Dublin. Her 1939 performance in Jamaica Inn, directed by Alfred Hitchcock, so impressed her co-star Charles Laughton that he cast her as Esmeralda in The Hunchback of Notre Dame. Laughton also renamed her, telling her that the name Fitzsimons was too complicated for Hollywood. O’Hara made a total of 58 pictures in a career which spanned almost 50 years. Her versatility saw her cast as everything from a Castillian to a French adventuress in a series of costume epics. She made a total of five films with John Ford, including The Quiet Man, How Green Was My Valley and Rio Grande. She also gave sterling performances in such timeless classics as Miracle on 34th Street. 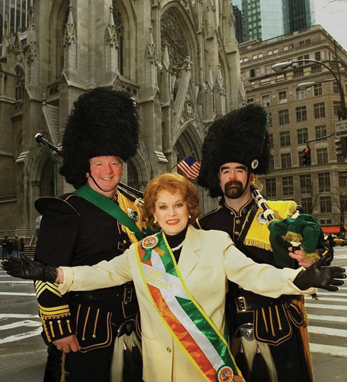 In 1998, Maureen realized a long-held ambition when she because the third woman to lead the New York St. Patrick’s Day Parade up Fifth Avenue. Adoring crowds shouted greetings as she marched along proudly. Maureen, who now lives in Glengarriff, Co. Cork, has written a memoir called Tis Herself, in which she expounds on her early days in Hollywood, her late husband, and love of her life, pilot Charlie Blair, her friendship with John Wayne, and the difficult to work for, but “brilliant” John Ford. Maureen now devotes herself to the The Maureen O’Hara Foundation which exists to establish a centre of excellence in film studies in Glengarriff.